For those on the Left, finance seems like a bourgeois pastime. Many of us outright despise the stuff. While the petit bourgeoisie drool over dividends and diversification, we prefer to focus on crisis and class. Much of that is justified. Prayers to the stock ticker are part of the reactionary playbook. Donald Trump, in between disrespectful tweets about the NFL and Puerto Rico, loves to applaud the stock market. Status-quo apologists hold up stock-index averages as evidence of economic progress, even though the stock market has next to nothing to do with how well most Americans are faring. And so leftists are right to operate with suspicion, or even hostility, when it comes to financial issues. The conventional Left disdain usually takes one of two forms. For some, finance is a quasi-criminal sham, some combination of fraud and parasitic appropriation. It serves no creative purpose; it’s just one giant rip-off. For others, it’s an occult realm of generative wealth creation, a form of mathematical sorcery wielded by a dark cabal of Merlin-Madoffs. But in both cases, the relationship between finance and the real economy is obscured by mystification. And the problem with those attitudes is that they tell us too much about what’s wrong with finance capitalism, and not enough about the potential for finance socialism. We needn’t give up on our commitment to distributive justice or the necessity of taming market chaos. But many leftists go too far in the opposite direction, oversimplifying or misunderstanding the role of finance in political economy entirely. For instance, in a recent interview with Jacobin, economist J.W. Mason characterizes finance as a system of social control. Throughout the interview, finance is characterized insidiously: as a means of enforcing the imperative to accumulate; artificially simulating competitive pressure; or merely as an agent of social disruption. Mason’s critical insights are accurate and helpful, but they don’t do enough to point the way toward a cognizable future. But we as socialists, Marxists, and progressives can do better. But soundbites won’t cut it, precisely because demystification was the central task of Marx’s critique of political economy. He sought to bring down to earth precisely those capitalistic phenomena that seemed to resemble magic. Marx is famous for laying bare the spectral mischief of the commodity fetish, but it’s just as important to do the same for money, credit, and finance. Today, as we all squirm in the thrall of finance capitalism, and as we approach a decade since the financial crisis, it’s not enough for socialists to engage in populist condemnation. Instead, we need to engage in demystification, and then pursue its complement: re-imagination. Socialists must rediscover a truly Marxian theory of credit, not merely a liberal or populist one. 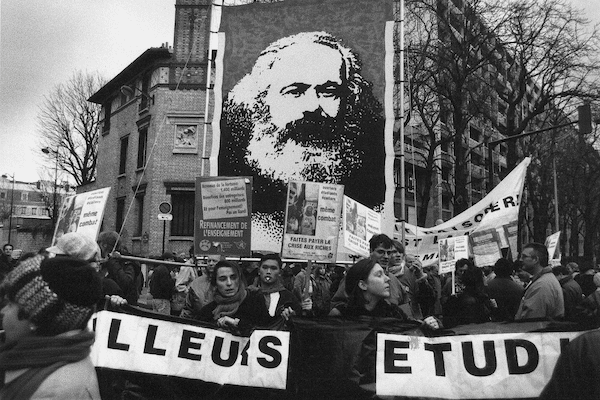 In Fictitious Capital: How Finance Is Appropriating Our Future, French economist Cedric Durand examines the Marxian concept of fictitious capital in the context of contemporary finance capitalism. In a useful comparison, Durand explores Marx’s view of fictitious capital with that of his ideological counterpart Friedrich Hayek, that formidable theoretician of the free market. According to Durand, Hayek was far more hostile to finance than Marx. For Hayek, fictitious capital is “an excess of credit as compared to savings.” In Hayek’s markets, credit creates illusory value if it’s not backed by existing savings. This excess can never be fully reabsorbed as productive capital, and the imbalance distorts the market’s ability to allocate resources efficiently. While for Hayek fictitious capital upsets resource allocation and leads to wastage, Marx takes a subtler view. For him, the anticipated validation of the valorization process can, up to a certain point, stimulate the real accumulation process. Nonetheless, he clearly emphasizes the disruptive effects that can result from financial phantasmagoria. In other words, Marx recognized that credit can play a legitimate role in organizing economic relationships. Perhaps surprisingly, it’s the free-market zealotry of Hayek that finds credit to be so fundamentally problematic. Recognizing Marx’s nuance here opens the door for imagining how finance might provide a structural basis for socialism. But what is meant by this? And how is this ambivalent view of credit specifically Marxian in character? In part two of this series, I’ll take a much closer look at the role of credit in Marxian political economy.